Publicity Stills of "Superman Returns"
Following a mysterious absence of several years, the Man of Steel returns to Earth in a new chapter in the powerful saga of one of the world's best-loved superheroes. While dealing with an old enemy’s plot to render him powerless once and for all, Superman faces the heartbreaking realization that the woman he loves, Lois Lane, has moved on with her life. Or has she? Superman returns! And in a style befitting a worldwide pop cultural icon easily recognizable from that distinctively red-yellow S-shield. Being stuck in production hell for almost 2 decades since the last movie installment, Bryan Singer has resurrected the Man of Steel for the silver screen, with an all new cast made up of fresh faces and veterans, even Marlon Brando, as Jor-El. He humanized Superman. It's no easy feat, but he pulled it off wonderfully. Being the last son of Krypton, sent here like a messiah with powers to conquer, it is too easy to dismiss him as a boy scout on a mission to save the world from evil doers and natural disasters, and take for granted that he does what he does, because he can. 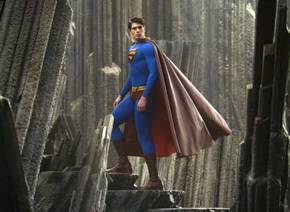 Singer worked plenty of emotions into Clark, as well as Superman, in feeling the isolation of an alien in an adopted home, in always trying to pretend to be what he's not. You feel his pain that despite being around his loved ones, he will never able to always be there for them, because of his higher calling. There are scenes which makes you feel just that - Here's Superman, but ok, now that you're safe and sound, he has to go wrap things up, see you around later. A man yearning to shut out the outside world for quality time, but not being able to do so, for who he is. For someone almost invulnerable, Singer worked into the story, moments where his invulnerability wanes. And I tell you, even the most stoic critic of Superman, will feel pain and anger when that happens. It's as if Superman was a fellow human being, and seeing him subjected to the cruelties of nasty human thugs, just makes the blood inside you boil. You want to help, but obviously can't since it's just a movie. But you feel just that way. Brandon Routh, a relative unknown, filled the shoes well as the new Clark Kent/Superman. He bore some resemblance to the late Christopher Reeve, and at times even sounded like a youthful version of Reeve too. He did a commendable job in not being over-awed in a role which is under constant spotlight, and he is believable both as the Man of Steel, and as the bumbling Clark. I believe Routh will win fans approval worldwide for his portrayal, and it should endear him as another definitive cinematic Superman. I like the continuation of that bit through conversation that Superman doesn't lie. Kate Bosworth too did a great job continuing the film version of the tough as cookie Lois Lane, though here the character has mellowed somewhat because she's a mommy now. And it's always the little things that count, that she still smokes, still is a klutz at times, and an extremely nice touch to progress from the first two Reeve-Kidder Superman movies, she finally won her Pulitzer Prize, although it was for her story which stung with a criticism on why the world doesn't need Superman. (Look out for that explicit jibe about the Oscars too). 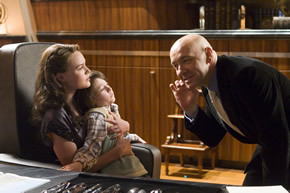 And not to forget, Kevin Spacey as Lex Luthor, criminal mastermind. Brain over brawn. It's interesting that Superman's greatest enemy has always been Lex, a mere human, but with a desire to eliminate Superman, and here, Lex wastes no time by lapsing into mindless monologues when going one up against our hero. Spacey's Lex is slightly different from Gene Hackman's, in that this one had a little more comedic flavour, though not always intentional. Spacey hams it up a bit, and made it somewhat scary - you'll never know what is going on inside his bald head. And there are some scenes which just crack you up at times, like the gig with the toothbrush (shan't say more). Lex's scenes were slow to begin with, but builds up into a megalomaniac's plot to become a landlord, again tipping the hat and staying true to the Hackman version. That means that there is no LexCorp, but that's just a minor upset. His array of wigs and headpieces are also included, and his female companion in Kitty Kowalski (Parker Posey) brought back shades of Eve Teschmacher from the 1978 movie, in having a thing for Superman and humanity in general. In reference to the earlier movies, Superman's ability to see through lies was also mentioned, and it worked into Lex's brainchild of an idea in having Kowalski put up as a sort of bait. Plenty of nice performances from the supporting characters, like X-Men's Cyclops James Marsden (does he hold the honour of starring in superhero movies from Marvel and Dc?) as Richard White, the Superman alternative of a man who can always be there for you, the family man with no cares of the outside world other than his own family, and Frank Langella bringing veteran clout as Daily Planet's Chief Editor Perry White. Sam Huttington's Jimmy Olsen was a natural too, rounding up our Planet's crew. There are plenty of exellent elements incorporated from the earlier movies, like the opening credits scene, spruced up of course, but you'll see touches of the original, and THAT all too familiar fanfare theme composed by John Williams has been combined into a new score as well. It's as if to signal an intention to reboot the franchise, but keeping with it the good bits from the earlier movies, saluting them, like in that final flight around earth's orbit. 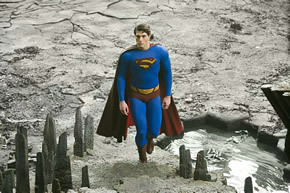 There are also many signature scenes which have already become part of the Superman mythos, put into the movie as well, like how reliant he is from Earth's yellow sun as his source of power - that flight into the sun rays to recharge, gave me the goosebumps, as did the scene where he tips a car, right out from Action Comics, as does his lifting of the globe scene, akin to Atlas carrying the weight of the world on his broad shoulders. And his constant staying in orbit to tune in to cries for help like a police radar, is just pure classic, which brings him to places around the world where his assistance is required. Now this might be premature, but if it's any indication, a World's Finest movie, if done correctly with Routh and Bale in their respective title roles, might just blow the minds of fans worldwide. Until then, this Superman soars and epitomizes truth and justice in a world that needs a beacon of hope. I like to believe that almost everyone who has encountered the Superman character, in print or in various media, is secretly admiring and supports the character, whether they like to admit it or not. Somehow a character who wears a cape and saves the world is boring and unhip somewhat. Singer's Superman might just bring all fans out in the open, and declare that yes, that's the Man of Steel whom we have been so familiar with, taking his rightful place amongst the better cinematic versions of other superhero movies. It's been 20 years and after such a long absence, can Superman return to the glory status he once had during the 80s? Well let me just start by if you loved the first two Superman movies, this faithful homage follow up will most likely please you. Everything that works during the first two Superman movies in the 80s are back. But then, everything that didn't work are back too. 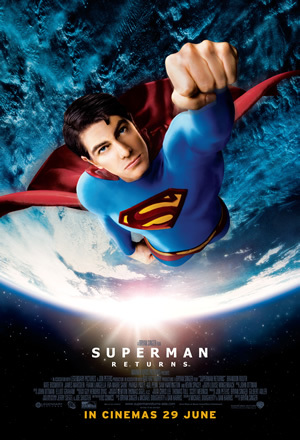 The plot has Superman (Brandon Routh) returning back to Earth after a five-year traveling in space looking for the remains of his planet. While trying to fit back into his old life, he discovers that his love had moved on in life without him. Lois Lane (Kate Bosworth) has earn a Pultzer Prize for a essay on why the world doesn't need Superman and is living with a 5-year-old son and a fiancé. Meanwhile, due to the absence of Superman, Lex Luthor (Kevin Spacey) was released from his jail term and hatched a new diabolic plan to rule the world (or at least most part of it). In order to do so, Lex and his henchmen returned to the Fortress of Solitute to steal the technologies that Superman's dad had left for Superman. Using this advance technology, Lex Luthor begins his conquest for more land and soon crosses path with Superman. Brandon Routh ace in the looks and mannerism department of Superman/Clark Kent. One of the things that Bryan Singer did right for this movie would be selecting Brandon Routh for this role as the man of steel. He was able to hit the comical timing as the clumsy Clark Kent and the presence of the world greatest superhero at the same time. In short, he brought back memories of what Christopher Reeves did for the previous Superman movies. Another great part of this movie would be the special effects which are commendable by the standards set in recent years. Most if not all of Superman's power were showcase in an even more realistic manner than it was ever possible and it was simply exhilarating. To see how bullets bounce off Superman in slow mo, to hear how super-hearing might really sound like and how X-ray vision might have work was one of the perks of watching this movie. However the story left me emotionally detach in a couple of ways. First off, it would be the lack of chemistry bit between Kate and Brandon. 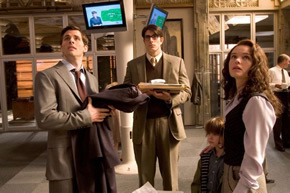 Parts of the film were spend mucking around anguishes and conflicts that Superman is experiencing for the love that he still have for Lois Lane. It’s a commendable bid to humanize Superman, showing that beside kryptonite, there other ways that Superman could be hurt. But then nothing much was effectively conveyed or expressed except the emotionless gaze at his ex lover which leave viewers like me uninterested. The other plot device that flopped was the master plan that Lex Luthor had in gaining more power. It was illogical even in a fantasy setting. Mastering technologies that are so advance was quite a stretch but it would still be believable if Lex Luthor's as brilliant as he made out to be. But the decision he made with the technologies he had was simply naive and unfathomable. In a way, it stayed true to the original Lex Luthor's master plan but didn't anyone stop to ponder, what are the consequences and will anyone actually want to move into a fortress like property? Then there was the manner that Kevin Spacey was made to play Lex Luthor which was a major disappointment. It's clear that it's homage to the old superman movies and Kevin Spacey was hammering up as the goofy Gene Heckman's version of Lex Luthor but we have seen how effective Kevin Spacey could be in villainous roles before and the version of Lex Luthor had been given a sophisticated update in both the TV series and comics realm that added layer of complexity to his character. But instead of giving the character more bite, the direction was reverted back to the old property hungry character and it just seem such an awful waste of talent. It's quite evident that Bryan Singer's objective is to pay homage to the first two Superman movies and humanize Superman further with the complexity of relationship problem. Audiences will most likely split in two camps, some that finds his directions satisfying and others who wished for more reinvention or reboot instead of a renewal.